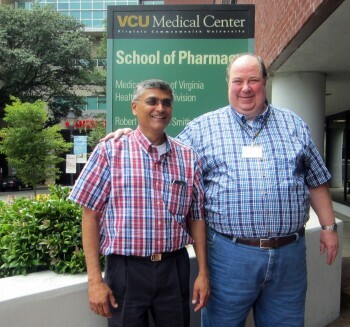 Two VCU School of Pharmacy faculty – Umesh Desai of the Department of Medicinal Chemistry and Jürgen Venitz of the Department of Pharmaceutics – will be honored during VCU’s 31st Opening Faculty Address and Convocation for having distinguished themselves and the university through their commitment to excellence, innovation and service. Desai will receive the Distinguished Scholarship Award and Venitz will receive the Distinguished Teaching Award. The event begins at 10 a.m. Aug. 21 at the Siegel Center, 1200 W. Broad St.
Also receiving faculty awards will be John Clore, School of Medicine, Distinguished Service Award; and Albert Farrell, College of Humanities and Sciences, University Award of Excellence. A new award, the President’s Award of Excellence, will go to Joseph Marolla, Office of the Vice Provost for Instruction and Student Success; and Presidential Medallions will go to Nancy Langston, School of Nursing (retired); H.M. Lee, School of Medicine (posthumous); and James Neifeld, School of Medicine. Ceremony participants will include VCU President Michael Rao; Beverly Warren, provost and senior vice president for academic affairs; and Sheldon Retchin, senior vice president for health sciences and CEO of the VCU Health System. In addition to his teaching, mentoring and research in the School of Pharmacy’s Department of Medicinal Chemistry, Desai is interim director of the university’s Institute for Structural Biology and Drug Discovery. He is nationally and internationally known for his work in developing a new line of anticoagulant agents expected to alleviate adverse affects seen in current thrombotic therapy used with heart attacks and strokes. His lab is working to design a synthetic mimetic of heparin, a commonly used, animal-derived anticoagulant agent that can cause adverse effects. That research has been key in launching a new field of medicinal chemistry — nonsaccharide glycosaminoglycan mimetics — and the molecules being developed might also prove to be of use in treating cancer, HSV, HIV and chronic wounds. Desai recently led a team of professors in applying for an NIH program project that established VCU as a Program of Excellence in Glycosciences along with five other institutions, including Harvard and Johns Hopkins. The seven-year grant will go toward making xenotransplantation, the use of nonhuman organs in humans, a clinical reality. Desai joined the School of Pharmacy faculty in 1998. He earned his M.S. and Ph.D. degrees in organic chemistry at the Indian Institute of Technology in Bombay, India, followed by postdoctoral fellowships at the University of Iowa and Massachusetts Institute of Technology. “Dr. Desai has published or has presented over one hundred scientific papers and holds several patents,” noted Richard A. Glennon, chairman of the Department of Medicinal Chemistry. “He has been continually funded since joining the department and currently accounts for about 50 percent of the department’s external funding. Venitz, who arrived at the School of Pharmacy in 1988, earned his M.D. degree and Ph.D. in physiology at Universität des Saarlandes in Saarbrücken, Germany. In between degrees, he worked as a postdoctoral fellow in clinical pharmacology at the University of Florida College of Pharmacy. He, too, is known nationally and internationally, especially for having coordinated and taught a dozen workshops at the National Institutes of Health and the Food and Drug Administration in this country and also in Germany and Brazil. Venitz is professor and vice chairman of the School of Pharmacy’s Department of Pharmaceutics, and the bulk of his teaching duties lie there. He has the distinction of being the only faculty member in the school who has teaching assignments in all three departments: Pharmaceutics, Medicinal Chemistry and Pharmacotherapy and Outcomes Science. He also has taught classes for VCU Life Sciences and the Department of Nurse Anesthesia. Despite teaching what he describes as “notoriously disliked” courses – pharmacokinetics and pharmacodynamics – Venitz is known as a well-liked and respected professor on both the professional and graduate levels. That might be partly due to the fact that he began tutoring at age 15 and has not stopped teaching and mentoring since. It might also explain why he received the School of Pharmacy’s first Teaching Excellence Award in 1990 – and again in 2011. “Dr. Venitz’s use of technology and mathematical stimulation to demonstrate core principles in the temporal basis of drug action on the human body has enabled him to raise the quality of his teaching and the comprehension of his students to levels that are far superior to most who teach in this area,” wrote Peter Byron, chairman of the School of Pharmacy’s Department of Pharmaceutics. If you wish to attend the 31st Opening Faculty address and Convocation, free charter buses will be available (if you have a valid VCU ID) between the MCV Campus and the Siegel Center. Buses will depart from the corner of 11th and Clay streets between 7:45 and 10 a.m., and will bring passengers back from the Siegel Center between 11:15 a.m. and 12:45 p.m.
Three VCU School of Pharmacy student organizations will play host to regional or national meetings within the coming year. Congratulations to Kappa Epsilon, Kappa Psi and SNPhA on the opportunity to showcase the school’s student pharmacist organizations to fellow pharmacy students, faculty and alumni from across the country! • The Tau chapter welcomes the 49th National Convention of Kappa Epsilon July 17-20 at the Richmond Marriott. KE fraternity was founded in 1921 to unite women in the profession of pharmacy, stimulate a desire for higher scholarship and foster professional consciousness. Nationwide, there are 43 collegiate chapters and 10 alumnae chapters. Tau chapter president: Kristen LaCoe. Advisor: Emily Peron, Department of Pharmacotherapy and Outcomes Science. • The Theta chapter of Kappa Psi hosts the Atlantic Province regional meeting Aug. 16-18 at the Omni Richmond Hotel. The oldest professional pharmacy fraternity, Kappa Psi was formed in 1879 to foster community involvement through professional activities. The Theta Chapter was installed in 1921. Nearly 20 chapters at colleges and schools of pharmacy in Georgia, North Carolina, South Carolina, Tennessee and Virginia make up the Atlantic Province. Theta chapter regent: Travis Henschel. Advisors: Tom Karnes, Department of Pharmaceutics, and alumnus Lawrence Lopez (Pharm.D. ’08). • The VCU chapter of the Student National Pharmaceutical Association welcomes the Region I and II Meeting to the Omni Richmond Hotel Feb. 28-March 2, 2014. Founded in 1972 as a student affiliate of the National Pharmaceutical Association, SNPhA is open to students concerned about pharmacy issues, professional development and the lack of minority representation in pharmacy and other health-related professions. Regions I and II comprise chapters at more than 40 colleges and schools of pharmacy. VCU chapter president: Nellie Jafari. Advisor: Leticia Moczygemba, Department of Pharmacotherapy and Outcomes Science. Students selected for Summer Research Fellowships this year – along with their presentation dates and locations and the names of their advisors – are as follows. Kudos and good luck to this summer’s research group. Each presentation takes place between noon and 1 p.m.
Summer Research Fellowship recipients receive a two-month stipend for their work, which is funded by the dean’s office. for a PGY1 residency in ambulatory care. The School of Pharmacy’s Pharm.D. class of 2013 is off and running! About 30 percent are pursuing postgraduate education via residencies or fellowships. About 70 percent have accepted positions in pharmacy practice ranging from community to hospital settings. Tom Reinders, associate dean for admissions and student services, says nearly 900 pharmacy residency programs across the country train pharmacists in professional practice and management activities. Residencies provide experience in integrating pharmacy services with the needs of individual practice settings and can lead to advanced practice skills and knowledge. A residency usually lasts one year, although many residents continue into a second year of more specialized training. According to the American Society of Health-System Pharmacists, a total of 2,866 PGY1 and PGY2 applicants were matched out of 4,480 applications this year. For more on the ASHP Resident Matching Program, click here. David Allen, Moses Cone Hospital, Greensboro, N.C.
Alissa Basehoar, Durham Veterans Affairs Medical Center, Durham, N.C.
William Cang, UC San Diego Medical Center, San Diego, Calif.
Catherine Floroff, Medical University of South Carolina Medical Center, Charleston, S.C.
Aisha Masood, Martinsburg Veterans Affairs Medical Center, Martinsburg, W.Va.
Rachel Seidman, University of North Carolina Hospitals and Clinics, Chapel Hill, N.C.
Seth Strawbridge, Hartford Hospital, Hartford, Conn.
Lauren Wyatt, Palmetto Richland Memorial Hospital, Columbia, S.C. The School of Pharmacy honored 2013 graduating Pharm.D. students during its annual Senior Banquet May 10 at the Hilton Richmond Hotel & Spa at Short Pump. Following a reception and dinner, awards were presented by Dean Victor Yanchick and Tom Reinders, associate dean for admissions and student services, with the assistance of Ron Ballentine, assistant director of admissions and student services. • Phi Kappa Phi: David Allen and Jeannie Kim. • Rho Chi: Ryan Albert, David Allen, Batoul Almomani, Alissa Basehoar, Jeffrey Beall, Merid Belayneh, James Carmichael, William Cang, Lauren Cherry, Deanna Flora, Cat Floroff, Ashley Goodrich, Timothy Inocencio, Julie Kaplan, Jeannie Kim, Andrew Maggard, Aisha Masood, Ruta Patel, Rose Salzberg, Justin Sigfried, Seth Strawbridge, Tiffany VanDervort, Yu-Sheen Wu, Lauren Wyatt and Tosha Wyatt. • Phi Lambda Sigma: David Allen, Cathy Arnatt, Alissa Basehoar, Merid Belayneh, William Coleman, Christine Darby, Cat Floroff, Ashley Higbea, Deborah Jackson, Julie Kaplan, Lauren Lakdawala, Aisha Masood, Brad McDaniel, Derek Mires, Rose Salzberg, Lesley Smith, Tiffany VanDervort and Amanda Walls. • Preceptor of the Year: Tyler Martinson, clinical specialist in internal medicine, Sentara Norfolk General Hospital. • Outstanding Employee Recognition Award: Cosmin Boanca, web developer with Phartech. • Faculty Award for Excellence in Teaching: Diana Mack, assistant professor, Department of Pharmacotherapy and Outcomes Science. To see photos from the 2013 Senior Banquet, click here. • J. Doyle Smith Award: Christopher Arnatt. Advisor: Yan Zhang. • John Wood Award and Pfizer Consumer Healthcare R&D Leading for Innovation Award: Poonam Delvadia. Advisor: Tom Karnes. • V.A. Yanchick Award: Osama Shoair. Advisor: Patty Slattum. • Charles T. Rector and Thomas W. Rorrer Jr. Dean’s Award for Excellence in Graduate Study: May Abdel Aziz. Advisor: Umesh Desai. • Lowenthal Award: Kavita Iyer. Advisor: Malgorzata Dukat. • Altria Tobacco Products Regulatory Sciences Fellowships: Morse Faria (advisor: Tom Karnes) and Christine Farthing (advisor: Doug Sweet). • Alpha Phi Chapter of Alpha Epsilon Lambda: Mostafa Ahmed, Antoinette Coe, Morse Faria, Yaena Min and Akul Mehta. • Phi Kappa Phi: Poonam Delvadia, Tanvi Deshpandi, Batul Electricwala, Timothy Inocencio, Sudha Korwar, Bassem Mohammed, Xiaolei Pan and Li Wang. • Phi Kappa Phi Scholarships: Poonam Delvadia, Bassem Mohammed and Farhana Sakloth. To see photos from the 2013 Graduate Awards Luncheon, click here. From left: Don and Gretchen Brophy, Nancy and Ron McFarlane. Donald F. Brophy has been named the first Nancy and Ronald McFarlane Professor of Pharmacy at VCU School of Pharmacy. Brophy currently serves as chairman of the school’s Department of Pharmacotherapy and Outcomes Science and is a professor of pharmacy and medicine. He holds a master’s degree in biostatistics and clinical research from VCU and a doctor of pharmacy degree from North Dakota State University. Nancy and Ron McFarlane established the professorship in 2008 in recognition of the foundational education they received at the School of Pharmacy. The McFarlanes, both of whom graduated in 1980, established their business, MedProRx Inc., in Raleigh, N.C., in 2002. In addition, Nancy McFarlane currently serves as mayor of Raleigh. The professorship was approved by the university’s board of visitors in February, and Brophy was officially selected as the first recipient. In May, Brophy met with the McFarlanes to express his gratitude and honor in holding the professorship in their names. The connection between Brophy’s research and the McFarlanes’ business demonstrates great synergy. The McFarlanes’ specialty infusion pharmacy, MedProRx, focuses on treatment for bleeding, autoimmune neuromuscular and rheumatologic disorders and other chronic conditions. Brophy’s primary research, which he has presented nationally and internationally, is in the areas of thrombosis, hemostasis and blood coagulation disorders in special populations. He directs the School of Pharmacy-based VCU Coagulation Advancement Laboratory, which conducts hemostasis and thrombosis studies with collaborators ranging from the pharmaceutical industry to the U.S. Army. In addition to the professorship held by Brophy, the McFarlanes previously endowed two scholarships for pharmacy students. McFarlane said he and his wife look forward to funding more professorships. They also hope to encourage former classmates to consider the school in their planned giving. “Everyone can make an impact by giving back,” he said. Outright gifts to the annual fund support current needs such as student scholarships, while planned gifts such as bequests or insurance policies can secure the future of the school. “As state funding for higher education continues to decline, we as alumni can ensure that today’s pharmacy students are receiving the same high quality experience that we did as students,” said McFarlane. Professorships and chairmanships can honor or memorialize faculty, family or friends, noted Dean Victor Yanchick. Among the areas that might be of interest to potential supporters, he said, are community pharmacy practice, geriatrics, infectious disease, cancer, pediatrics and pharmacogenetics. Given the widening scope of pharmacy practice, the school now has teaching and research faculty involved in each of these areas, many of whom have been hired during Brophy’s four-year tenure as department chairman. Brophy, who originally joined the faculty in 1996, speaks highly of the McFarlanes, both professionally and personally. “They have done extraordinarily well,” he said, “and they are very nice and awfully warm. If you would like to include the School of Pharmacy in your planned giving, please contact Brian Thomas at the MCV Foundation: (804) 828-0067 or bsthomas@vcu.edu. If you would like to make a donation now, contact Ellen Leverich Carfagno at the School of Pharmacy: (804) 828-3017 or emcarfagno@vcu.edu. A memorial fund has been established in honor and memory of VCU School of Pharmacy associate professor Amy Whitaker Rudenko. The school will use the fund to make awards to selected Pharm.D. students who have demonstrated leadership qualities. “It was created to help keep Dr. Rudenko’s name and spirit alive into perpetuity,” said Dean Victor Yanchick. Hundreds of family members, friends, students, former classmates, faculty and staff from the school as well as from other organizations with which Rudenko had worked or volunteered – Kmart, CVS, the Center for High Blood Pressure and CrossOver Health Care Ministry, to name a few – gathered June 1 to pay tribute at Bliley’s Funeral Home Central in Richmond. In addition, former VCU community pharmacy practice residents from across the country came to pay their respects. The service was conducted by the Very Rev. Nicholas Bacalis of Sts. Constantine and Helen Greek Orthodox Cathedral. He was assisted by Deacon Nicholas Zachary, cousin of Amy Rudenko’s husband, Mike. Several longtime friends and colleagues shared their fond remembrances. Questions may be addressed to emcarfagno@vcu.edu. To see an album of recent photos, please click here. Positive. Passionate. Happy. Enthusiastic. Ask anyone who knew her to describe Amy Whitaker Rudenko, and these will be among the first words you hear. The VCU School of Pharmacy community – faculty, staff, students, residents, preceptors and alumni alike — were shocked and saddened to lose one of the school’s brightest lights when associate professor Amy Rudenko, 38, died May 25. She had been diagnosed with cancer just the week before. The former Amy Whitaker had a heart for pharmacy early on. Following graduation from Godwin High School in Richmond, she went on to become a founding member and the first president of the pre-pharmacy club at James Madison University. 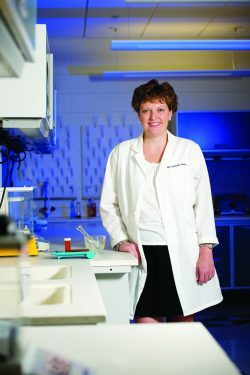 In 1994, she returned to the Richmond area to begin her studies as a first-year student in the School of Pharmacy’s Pharm.D. program. After earning her doctor of pharmacy degree in 1998, she was accepted into the community pharmacy practice residency program. Professor Jean-Venable “Kelly” Goode, one of the residency program’s preceptors, believes the residency is what piqued her interest in academic pharmacy practice. Rudenko’s positive attitude made her a joy to be around and to work with, added Goode. Ryan Templeton, a third-year pharmacy student, is president of the Virginia Academy of Student Pharmacists, which Rudenko had served for several years as faculty advisor. “Dr. Rudenko was passionate about helping students in VASP develop into professionals,” he said. “She was consistently reminding us that professionalism required a lot of a person, and she led by example every day. No matter what her schedule, she would take time to work with students and talk with them, offering advice when it was greatly needed. Just over a month ago, Rudenko was honored during Reunion Weekend with the school’s 2013 Distinguished Pharmacy Alumnus Award. A long list of accomplishments included her work as a clinical assistant professor at UNC-Chapel Hill; serving as a relief pharmacist at CVS; becoming a Board Certified Ambulatory Care Pharmacist; assisting several Kmart pharmacies in developing patient care activities in the areas of diabetes care, health screenings and immunization services; and receiving the Virginia Pharmacists Association’s Pharmacists Mutual Distinguished Young Pharmacist Award in 2004. In nominating her for the Distinguished Pharmacy Alumnus Award, Dean Victor Yanchick called Rudenko a force of positive energy for the profession of pharmacy. He congratulated her for having made an impact on a generation of pharmacists as a teacher, practitioner and leader. Rudenko, who had received the School of Pharmacy’s Alumnus Service Award in 2008, began working with the MCV Alumni Association soon after graduating. She was a trustee-at-large and past vice president of the alumni association’s Pharmacy Division. Barbara Payton, former MCVAA executive director, said, “I feel so honored to have worked so closely with Amy. … She was the type of volunteer who was always present at all of our activities. Despite a jam-packed calendar and a willingness to volunteer whenever asked, Rudenko enjoyed a full life at home. She and Mykola “Mike” Rudenko Jr., who were married in 2009, would have celebrated their fourth wedding anniversary on June 12. Their first daughter, 2-year-old Olivia, was a regular and welcome addition at pharmacy functions, and 3-month-old Abigail was well on her way to catching up with big sister. Abigail was at the MCV Alumni House in April — in her dad’s arms — as her mom stood up, to much applause, to accept the Distinguished Pharmacy Alumnus Award. Brophy, Rudenko’s department chairman, noted that losing a life force like Amy Rudenko should inspire everyone to reflect on what’s important and how we all need to live our lives to the fullest. “Amy was inspirational to me in that she never appeared to have a bad day,” he said. “She had such grace. Amy Whitaker Rudenko is survived by her husband, Mike Rudenko Jr., her children, Olivia Lynn and Abigail Iryna; her parents, Barry and Linda Whitaker of Manakin-Sabot, Va.; her brother Barry K. Whitaker, and his wife Lisa of Chesterfield, Va.; her maternal grandmother, Marjorie Wilson of Roanoke, Va.; her mother-in-law, Irene P. Rudenko; her sister-in-law, Lisa Holly; nieces Jane and Jordan; and nephew Cole. Visitation for family and friends will take place 4-6 p.m. May 31 at Bliley’s Funeral Home Central, 3801 Augusta Ave. in Richmond. A memorial service will begin at 2 p.m. June 1 at Bliley’s. To see snapshots from the School of Pharmacy’s 2013 Hooding and Diploma Ceremony, click here. pestle, medicine bottles and the Smith Building. Yanchick’s previously announced retirement, effective Jan. 1, 2014, became a sort of graduation theme for the class of ’13. As part of its gift to the school, the class asked him to paint a watercolor that will hang in a first-floor conference room in the Robert J. Blackwell Smith Jr. Building. The class will make a donation to pharmacy student scholarships and, in addition, it gave the school a Virginia flag and a United States flag for use in the Smith Building lobby. The class of ’13 also requested that Yanchick administer the Pharmacist’s Oath at ceremony’s end. In his speech to the more than 150 Pharm.D., M.S. and Ph.D. graduates at St. Paul’s Baptist Church, Virginia’s 98th District Del. Keith Hodges (B.S. ’89) thanked Yanchick for his visionary leadership and years of service. “Of course, we know you will never really retire,” he added with a smile. Yanchick told students that earning their degree might be the greatest sense of accomplishment they will feel … until they see their children or grandchildren do the same thing. At a time when the field of pharmacy is quickly evolving and offers a multitude of opportunities, he said, this generation has the power to change the profession. But, he cautioned, remember the importance of time spent with family, friends and loved ones. It is with a great deal of pleasure that I extend to each of you my sincere congratulations on this most important occasion. I join with the entire faculty and staff of the School of Pharmacy and with the wider university community in celebrating your graduation. To our graduate students: We wish you every success in your career as researchers, scientists and educators. We congratulate you on successfully completing the rigors of a very intense program of graduate study. And to our doctor of pharmacy class of 2013 graduates: This is the day you had in your sights for a long time, and now it is finally here! Today you sit here, ready and proud that you got the job done. Your sense of pride and accomplishment is as high as it may ever get – with one exception. And that’s the commencement that involves your own child or grandchild. When you sit and watch your child or grandchild graduate, you will know what pride and happiness is really all about. Parents and grandparents, am I right? Your parents and all of your loved ones know – they worked and prayed – they worried – and they made many sacrifices for you so that you may enjoy this moment. Today you celebrate the achievement of a significant milestone in the career odyssey you began when you first decided to pursue pharmacy as your chosen profession. I remember telling you at your White Coat Ceremony that these four years will go by quickly, and I am sure today you wonder where all the time has gone. With your pharmacy degree, you have made a wise choice to secure a sound future in a rapidly changing health care environment. And I know that many of you are saying to yourselves right now that the hardest part is over, and the easy part is about to begin. But I am here to say if that’s the way you feel, you are in for a big surprise. The truth is now you’ve finished the easy part; the hard part is about to begin. And I say this for reasons that you may not fully understand today and for reasons that have absolutely nothing to do with your professional career. I am sure that most of you are thinking to yourselves that your real happiness is about to begin. But you will soon get caught up in the real world where there will be many obstacles in your way, and where things may not always go the way you wanted them to go, and you are not as happy as you thought you would be – and you can’t understand why – and you may blame it on the wrong reason. A professor stood before his class and had some items in front of him. When the class began, he picked up a very large and empty glass jar and proceeded to fill it full of golf balls. He then asked the class if the jar was full. They agreed it was. The professor then picked up a box of pebbles and poured them into the jar. He shook the jar slightly. The pebbles rolled into the open areas between the golf balls. He then asked the students again if the jar was full. They again agreed that it was. The professor then picked up a box of sand and poured it into the jar. Of course, the sand filled up everything else. He asked once more if the jar was full. The students responded with a unanimous yes. The professor then produced two cups of coffee from under the table and poured the entire contents into the jar, effectively filling the empty spaces between the sand. The students shook their heads and smiled. “Now,” the professor said, “I want you to recognize that this glass jar represents YOUR LIFE. The golf balls are the really important things in your life – they are your family, your children, your health, your friends, your faith and, yes, even your hobbies – and if everything else was lost and only they remained, your life would still be full. So pay attention to the things that are critical to your happiness. Play regularly with your children, spend quality time with your spouse or your soul mate, your best friends and your parents and family. Visit your parents and grandparents regularly because they really want to see you, and you will really miss them when they are gone. Always keep close to you your dear ones – tell them how much they mean to you, and take care of them. Hug your dad, kiss your mom and tell your brothers and sisters how much they mean to you. Take time to say I am sorry, forgive me, please, thank you¬ – and all the nice words you know. Take a friend out to dinner. Take time to get regular medical check-ups. Listen to your body. Exercise regularly. Take up a new sport – like racquetball! Eat sensibly, don’t smoke or take any prescription drug that is not prescribed for you. Find a hobby. Learn a new language. Take painting lessons! If you haven’t already done so, find someone in your life who loves you unconditionally and who you love unconditionally in return. And remember, it is a partnership. I know for a fact that I would not be standing here today as your dean if I did not have the loving support, through the years, from my wife. Take care of your golf balls first – the things that really matter. Set your priorities because the rest is just sand. Value things not for what they are worth but for what they represent to you. You see, there will always be time to watch “Dancing With the Stars” or to wash your car. This is what I call establishing a work-life balance. Within this work-life balance, you must also learn to have a sense of humor, to laugh at yourself and to have fun. These are such important skills. So never lose them. And remember, time waits for no one. So don’t wait until you have paid off your student loans, finished a residency, received a promotion, lost 10 pounds, get married, have kids, get divorced, until your home or new car is paid off. Until next year, until you’ve had a drink, until you’ve sobered up, until after you retire or until you are diagnosed with a life-threatening illness. You must decide that there is no better time to be happy and enjoy life than RIGHT NOW. And remember. Happiness is a JOURNEY … NOT a destination. You see, it took me a while to learn this. But I finally learned that if you try to pursue happiness, it will elude you. But if you focus on the golf balls in your life – your family, your friends, your health and your faith – happiness will find YOU. Think about the people who gave so you could be here. The people in your life – your parents and loved ones – who provided you with time, the love, the support and, yes, the money. Never forget the faculty and staff who supported you in the School of Pharmacy – and your fellow students and friends. The spirit of caring for each of you fills this building. Please know that we all care very deeply for you, and we are very proud of you. In closing, graduation is a time to reflect. As a parent who has been on both sides of a few graduations, I can tell you, regardless of what you ultimately achieve, the most important times are the ones like today, the ones that you will share with your family and friends and loved ones. Graduation is not an ending – it is your commencement – it is your beginning. You came to the School of Pharmacy four years ago and have undergone a wonderful transformation from very naive student pharmacists into competent health care providers who have the power to change the profession. Yes, I said change the profession!! Don’t listen to those who tell you that you cannot change the profession. Always keep this in mind. There are only two types of people who will tell you that you cannot change the profession: those who are unwilling to change and, more importantly, those who are afraid you will succeed! Your future will be nothing like you imagine. What will seem natural in hindsight may seem unlikely or even impossible to you now. So think off the map and go into unknown and unchartered territories in your practice. That is what leaders do, and it is how you can change the profession. I wish all of you the very best as you begin to build your future for yourselves, for your family and for the profession of pharmacy. I hope you will carry with you a feeling of pride and accomplishment as you leave us. We are honored that you chose to build your professional foundation with us, and we hope that you will allow us to continue to play a significant role in your professional growth. We all take pride in you, and we are indeed very fortunate that we had the good privilege to have touched your life in a very special way. To take advantage of our blessings – our families, friends and colleagues – to do the most good you can – for the most people – and for the rest of your lives. I bid you farewell and wish you all the best in the years ahead. You are the last class that I have the honor of graduating, so I will always remember you in a special way. And thank you for making my life more fulfilling and rewarding. Thank you, good luck and welcome to the profession of pharmacy. Aunts, uncles, cousins, nieces, nephews? Thanks to our convocation speaker, Delegate Keith Hodges, the Graduation Committee and to Associate Dean Reinders and his staff, and to my administrative assistant, Suzanne Fairman, and to Scott Crenshaw, who have made this convocation a success. I will see all of you this evening at our Senior Awards Banquet and then tomorrow morning at the VCU Commencement, where I will call upon your class to stand as the president of the university confers on you the degree of doctor of pharmacy. 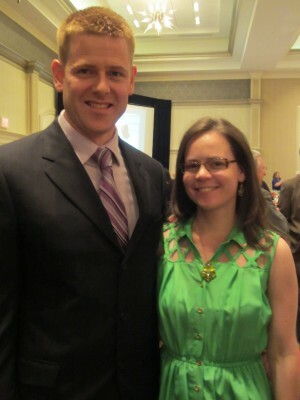 Preceptor of the Year Tyler Martinson and his wife Stacy attended the VCU School of Pharmacy’s annual Senior Banquet. Tyler Martinson of Norfolk has been named VCU School of Pharmacy’s 2013 Preceptor of the Year. Martinson, a clinical specialist in internal medicine at Sentara Norfolk General Hospital, was recognized during the school’s Senior Banquet on May 10 at the Hilton Richmond Hotel and Spa at Short Pump. Teaching is the basis of precepting, but the best preceptors go above and beyond. So the School of Pharmacy gives students, fellow preceptors, faculty, administrators and residents the annual opportunity to nominate exemplary preceptors who demonstrate initiative, commitment and excellence as teachers, role models and mentors. The winner is selected by a committee of students, faculty and past award recipients. “With 30 percent of the curriculum requiring experiential learning activities in authentic pharmacy settings, the success of each student depends on pharmacists who can serve as role models and faculty in the field,” said School of Pharmacy Dean Victor Yanchick. “They guide students in the application of knowledge and skills learned in the classroom to patient care in pharmacy. Accepting the Preceptor of the Year award, Martinson encouraged graduating students to consider being preceptors themselves. There’s nothing more rewarding, he said, than to help educate one’s future peers, knowing you’ve done a good job and that one day those whom you assisted will be standing next to you. Preceptor of the Year nomination packets must include an essay by the nominee. In his essay, Martinson wrote that his greatest professional satisfaction is in seeing a student grow. “I know I would not be where I am today if I did not have other pharmacists that were willing to teach me. There is so much information to learn during the first three years of pharmacy school, and I feel it is my job to help the student dig back in their mind and learn how to apply the essential information clinically. In addition to Preceptor of the Year, Outstanding Preceptor Awards are presented to recognize one preceptor in each of the nine Advanced Pharmacy Practice Experience rotation blocks. At the end of each rotation, fourth-year students are asked to nominate individuals who have demonstrated excellence in precepting. Congratulating all the winners and nominees, Phylliss Moret, assistant dean for experiential education, said more than 100 nominations were submitted for this year’s preceptor awards. The School of Pharmacy, she noted, works with about 1,000 preceptors in Virginia and out of state.